When I was allowed to exhibit my design, I thought how to make my chair. First, I wanted to make it myself, but i didn’t have an enough skill. Next I tryed to find out an artisan people to order it. and I went to many of the order funiture shop to asked about it. 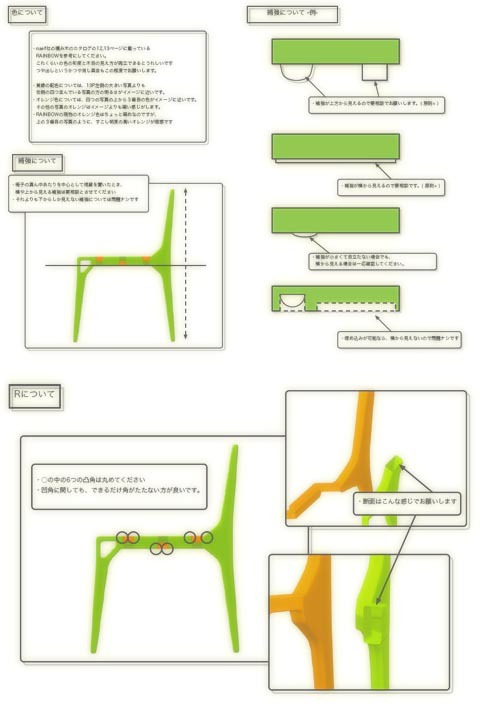 Many peoples said NO cos the chair design had a problem at the toughness. Funiture artisans have a know-how to make a strong chair. But my chair is too strange to make enough strong chair for our sitting weight. and my chair have 8 frames dispersed the sitting weight for 16 feet, instead of the plate. No one have the know-how to make no plate and 16 feet chair. In their toughness test, they throw their chair at special wall and floor, again and again. But my chair will broken to pieces at first attack in the test. Yes, I didn’t want to toughness for my chair, because I wanted show my design and thinking. and OK if we couldn’t sit down at my chair. But most of artisan looked never made such as seatless chair. (maybe they sweat by their artisan spirit). some people helped me,and few artisan peoples gave me a positive investigation. I was so grad that. thanks. there was very near from my office, CASA MATERIA. happy! but their contracting factory was in Hokkaido very north from Tokyo. That’s too far to contact the factory’s artisan peoples directly. At once I made plans and specifications document to contact them.